Architects & Designers: Why Spec King MediGrade®? King MediGrade® is a super tough polymer building sheet with an advanced antimicrobial technology for protecting the product surface against stain and odor causing bacteria, algae and fungi. The antimicrobial agent is bonded at the molecular level and will not leach out of the product. Unlike surface antimicrobials, King Plastic’s advanced antimicrobial technology protects against bacterial degradation for the lifetime of the product. 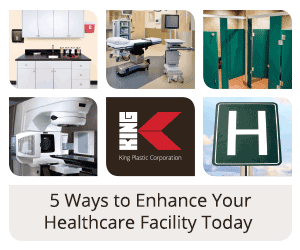 Healthcare facilities, medical equipment and case goods made with King MediGrade® will stay cleaner and fresher between cleanings. Studies have shown that surfaces with the antimicrobial technology can inhibit the amount of certain product-damaging bacteria by 99.9999%* compared to an untreated surface. See application photos and learn more by visiting the King MediGrade® page. *For bacteriostatic, fungistatic, & algistatic properties. This product is exempt from registration under 40 CFR 152.25(a). King MediGrade™ effectiveness verified by ISO and ASTM standards. This product does not protect users or others from disease-causing bacteria. Always clean this product thoroughly after use. “When a patient develops a health care-associated infection (HAI), it is often difficult to determine where it originated. It could be from ambient air, countertops, water faucets, privacy curtains, bed rails, direct hand contact or any combination of these.” Read full article. King MediGrade® is a super tough polymer building sheet with an advanced antimicrobial technology for protecting the product surface against stain and odor causing bacteria, algae and fungi. The antimicrobial agent is bonded at the molecular level and will not leach out of the product. Unlike surface antimicrobials, the advanced antimicrobial additive protects against bacterial degradation for the lifetime of the product. Healthcare facilities, medical equipment and case goods made with King MediGrade® will stay cleaner and fresher between cleanings. Studies have shown that surfaces with the antimicrobial technology can inhibit the amount of certain product-damaging bacteria by 99.9999%* compared to an untreated surface. North Port, Florida, October 15, 2015 – King Plastic Corporation, a leading manufacturer of polymer sheets, slabs and massive shapes introduces King MediGrade®, the antimicrobial polymer building sheet for healthcare applications. King MediGrade® combines designer colors, durability, and antimicrobial technology into one polymer sheet to bring architects and designers to the next level in healthcare design. King MediGrade® is a super tough polymer building sheet with an advanced antimicrobial technology for protecting the product surface against stain and odor causing bacteria, algae and fungi. Studies have shown that surfaces with the antimicrobial technology can inhibit the amount of certain product-damaging bacteria by 99.9999%* compared to an untreated surface. 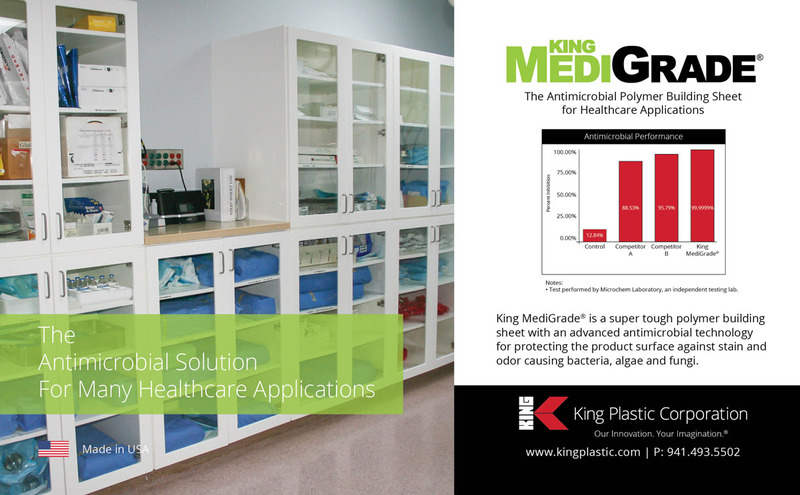 King MediGrade® is a perfect material for cabinetry, case goods, clean rooms, dental facilities, hospitals, locker rooms, medical facilities, laboratories, nursing homes, nurses’ stations, rest rooms, medical computer carts, and veterinary facilities.